The Galaxy Club, titled after a group of supernatural thugs, stumbles back and forth until its final declaration of strained hopefulness. Connell’s eccentric work tracks a modern-day-male Cleopatra on his passage through a small town in rural New Mexico. On his search for ‘the world’s end,’ Cleopatra finds himself involved with a search for hidden gold, a relationship, and a masochistic cult. Set in modern day America –ripe with pharmaceutical addiction, unemployment and poverty –the town seems to exist simultaneously in and out of the present. Witches, treasure, Blue Boys, the eponymous group of godlike tyrants, and water dragons are but few examples that place the work in the realm of Greco-Roman mythology. Connell explores this immensely complex plot by shaping the narrative into a series of confession-style vignettes, which move fluidly between past and present, natural and supernatural. Each section is organized by character (though character must be thought of broadly here as it encompasses ‘Those Underground,’ ‘Demon Taming Stick,’ or ‘Our Little Lady of the Trunk,’). The sections range in size –the shortest being a single paragraph –and in frequency –some characters speak only once, and all the sections are relayed in first person narrative. With no consistent pattern or guiding framework it is easy to get lost in the labyrinthine text. The closest we get to a landing point is Cleopatra. However, the small sections ask perhaps too much of the reader in assessing what should and should not be taken seriously. Nearly every section features Cleopatra imbibing alcohol, cough syrup, or both. Though Connell downplays the mental fogginess of an addict, its constant presence is enough to question the narrators’ reliability. What is certain is that the characters all function within a set of binaries –past and present, natural and supernatural –and waver between these opposing spheres. Blue Boy is the character freest to pass within these binaries. Blue Boy, whose natural birth was gifted by the supernatural ‘god’ of fertility, L5Flower, literally embodies the merger between these two worlds. That said, not much time is spent reflecting on this convergence and, rather, Blue Boy’s involvement in both worlds is a constant source of trouble. The friendship between Blue Boy and Cleopatra may be essential to bridging the gap between past and present but the first person vignettes leave little room for a much needed reflection on the bizarre situation. With such grand spectrums, the work might have benefitted from longer passages to clarify some of the questions raised that are wrought with folkloric wonderment. On the other hand, the fast pace lends itself to the mythical milieu and is perhaps best left ephemeral and mystical. 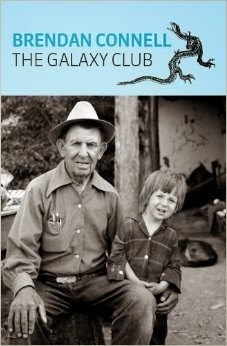 Purchase The Galaxy Club HERE. Reviewer bio: Corinne Bennett graduated in 2013 from Goucher College with a degree in English Literature. She is currently an intern at Ugly Duckling Presse and lives in Brooklyn.